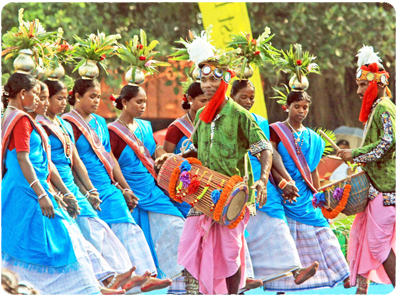 Jharkhand is a land of rich tribal life and culture, folk songs and dances. Tribal culture is distinct and rich. The state has one of the largest concentrations of tribals in India forming 26.3% o of total population. The tribals of the state observe a sting of festivals. The culture of Jharkhand encompasses its languages, dance, drama, music and painting and is characterized by the distinct tribal or folk forms. Chhau is famed dance form in Jharkhand. The word Chhau is derived from the Sanskrit Chhaya or shade. This is due to the fact that mask is used by the dancers. Chhau form of dance is done by men. The themes are taken from everyday life, mythology and aspects of nature. Chhau Dance (a form of folk dance) Centre has been set up at Saraikela by the Jharkahnd government which has also established Bharatiya Nritya Kala Mandir at Ranchi and Dumka. Jharkhand has as many as 30 indigenous tribes, the important of which are –etc. out of these nine are primitive ones. The most important aspect of tribal culture is the music and dance. Although under the influence of modern civilization, things are changing very fast, the tribals have retained at many places their traditional way of life. Jharkhand is a treasure house of arts, crafts and handlooms known for their exclusivity and specialty.